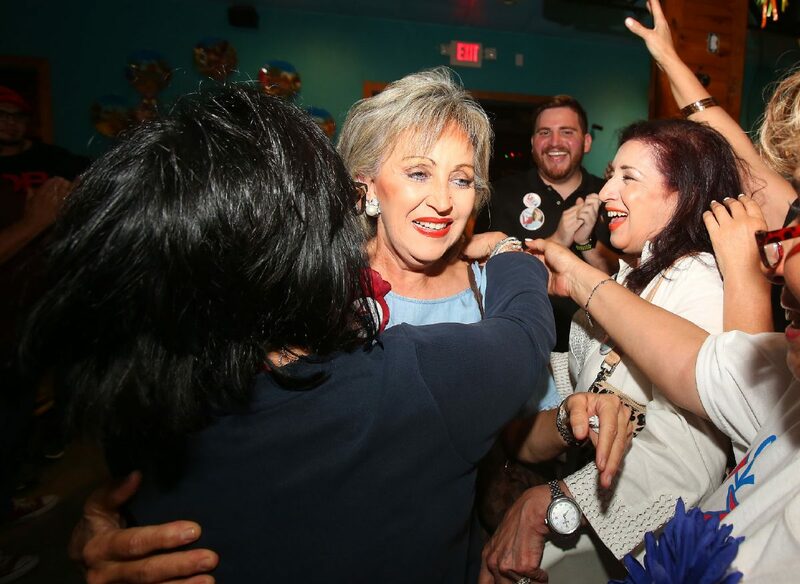 Dominga Vela, candidate for Edinburg School board Place 1 trustee, celebrates with supporters at Margarita's restaurant Tuesday, Nov. 6, 2018, in Edinburg. McALLEN — Nearly a dozen school board elections were decided Tuesday in Hidalgo County, and while some voters were drawn to the polls mainly by bigger races, such as the U.S. Senate contest, they still selected new school leadership. Among the two most contested were Donna and Edinburg school districts with three and four open seats, respectively. “I have been out of school for around eight years and haven’t followed what’s happening recently,” said Greg Garcia, 27, adding he also visited the polls mainly for the Senate race. 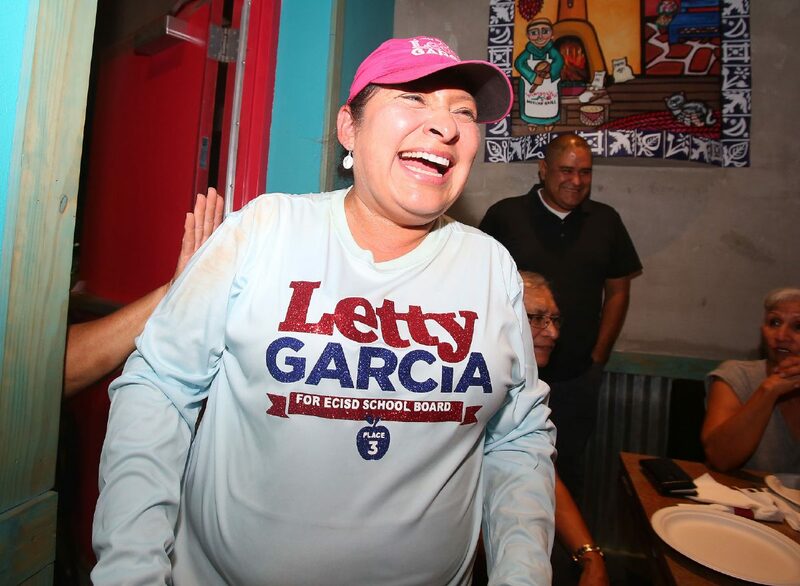 Leticia Garcia, candidate for Edinburg School board Place 3 trustee, laughs with supporters as she celebrates at Margarita's restaurant Tuesday, Nov. 6, 2018, in Edinburg. 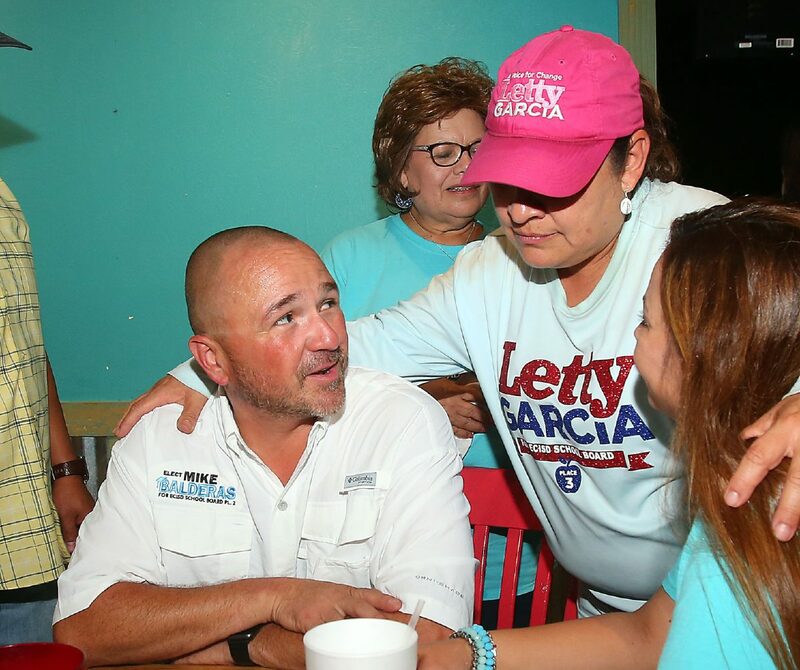 Michael Balderas, candidate for Edinburg School board Place 2 trustee, talks with Letty Garcia, candidate for Edinburg School board Place 3 trustee, at Margarita's restaurant Tuesday, Nov. 6, 2018, in Edinburg. Edinburg school district had eight candidates seeking the four open spots, and at least three incumbents running. Incument Juan “Sonny” Palacios lost Place 1 to newcomer and school district administrator Dominga “Minga,” Vela who took 53.5 percent of the vote, according to unofficial results. In Place 2, incumbent Oscar Salinas kept his seat with 54 percent of the vote against Mike Balderas. Place 3 had two new candidates Letty Garcia and Steven Cruz, and Garcia took the seat with 63.5 percent of the votes. Incumbent Xavier Salinas also kept Place 5 with 56 percent of the vote against Leonel Guerrero. Attempts to reach Palacios, who served on the board for eight years, for comment went unanswered. Ten candidates sought the three open seats at Donna school district and only two incumbents were vying to stay. Places 5 and 6 were sought by four candidates each. Incumbent John Billman lost Place 6 by less than 300 votes to Roberto Perez, who had 32.6 percent of the votes. Place 5 was contested by four candidates and most of the votes went to David De Los Rios, who took 32.5 percent of the vote and was trailed closely by Julian “Jay” Villarreal, who had 30.3 percent. Incumbent and current board president Efren Ceniceros also lost Place 7 to his sole challenger and former school district administrator Maricela Valdez, who took 54.1 percent of the vote. The fact that the district has state vigilance through a conservator and new programs in place to better train trustees, keeps Ceniceros confident that the district is still heading in a restorative direction, he said. Voters in Donna echoed the sentiment that they were not too familiar with school elections, but those who had connections to the district said they would like more emphasis on education. “I want them to focus mainly in education, some schools just let (the students) do whatever they want. So more strict rules,” said Araceli Moreno, who has four children in the district.